This issue’s featured artist is Ginger Deverell. She is a mother, wife, book hound, and nature lover. 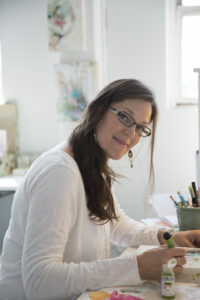 She is also an artist, illustrator and surface designer. She works from her cozy attic studio in her early 1900’s home in Sapperton, New Westminster, Canada. Ginger creates portraits, patterns, florals and artistic prose—offering visual reminders of the strength that lives in beauty and the beauty within ourselves. This painting depicts an elegant and whimsical fairy-winged woman with all the strands of her life woven into her wings and the words “In Transformation” inked on her forehead. It speaks to the journey we are all on to unearth, remember and fully embody who we are. We fear, we trust, and we spread our wings to fly. Sometimes we fall and get back up. Sometimes we feel lost and uncertain. Each step of our journey takes us to our next truth. This is the journey of transformation. 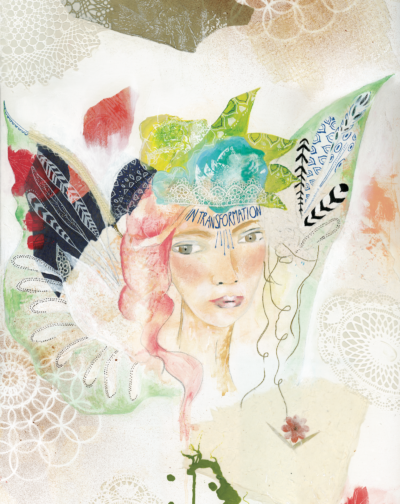 I was drawn to use imagery of a fairy because of the playful and delightful magic I remember as a child when reading or daydreaming about fairies. I love the idea of having wings and taking flight.